Reports that the leadership of four-year-old anti-austerity party Podemos are considering re-branding in 2018 may be “fake news”, but after what was clearly an annus horribilis last year, this year could well see strategic changes in the party’s direction as Podemos’ electoral fortunes appear to be plummeting in national voter preference surveys. 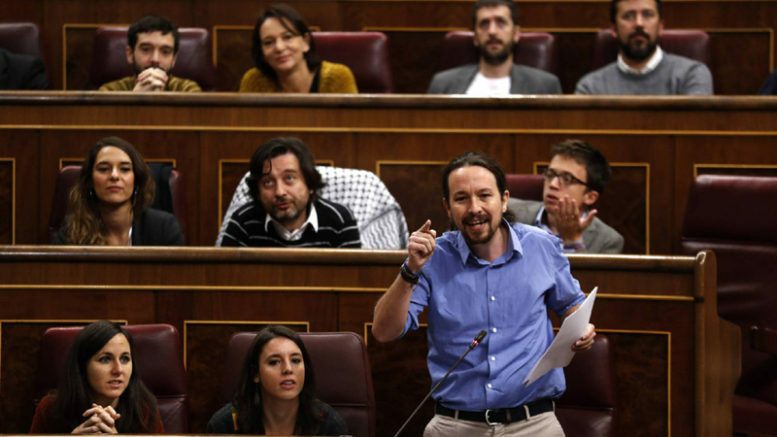 At the first meeting in 2018 of the party’s national citizens council on Saturday, Podemos general secretary Pablo Iglesias is expected to present an overview of what went right and wrong in 2017, as well as his vision for how best to revive the party’s prospects nationwide amid apparently lagging voter confidence and the resurgence last year of the leftwing rival Socialist party (PSOE). According to the results of three recent voter surveys from polling organizations Metroscopia, the Centro de Investigaciones Sociológicas (CIS) and NC Report, were new general elections to be held today Podemos’ share of the national vote would likely fall dramatically, pushing the party into fourth position among Spain’s political parties behind Ciudadanos — and farther yet behind the PSOE, who at one point during hotly contested 2016 general election campaign it seemed might actually be surpassed in vote share by Podemos. Although Podemos leaders have denounced as “fake news” the reports that they are considering a name change, the party leadership has yet to come to grips with a poor showing in the Catalan regional elections in December, in which against all expectations the Podemos backed Catalunya en Comú-Podem coalition saw its vote share fall to 7.42 percent, winning just 8 of 135 seats in the Catalan regional Parlament. Analysts blame the poor national survey results of recent weeks on Podemos’ unclear messaging on the Catalan independence issue — supporting the regional independence referendum as a “legitimate mobilization” against the Spanish government in Madrid, while at the same time saying the party is steadfastly opposed to the region’s independence from Spain. The confusion over Catalonia led to a public rift in the Podemos leadership in October, with party co-founder Carolina Bescansa openly criticizing Podemos general secretary Pablo Iglesias for spending too much time on the Catalan question and not enough time considering the party’s national priorities.